Could this space be any more inviting? Fireside dining accented with nature inspired accessories is pretty hard to beat! My client's love of Chinoiserie inspired decor guided most of our choices - and those whimsical roman shades provide the right amount of color and interest. I shared the photo above so you could see how the attached family room ties into the color palette and the feel of the breakfast nook. Here's a little peak from the kitchen into the family room. The blues and greens found throughout the home's main level are repeated in the living room, along with nature inspired accessories and some textural rattan pieces. The alabaster lamp was part of my client's personal collection, and it works beautifully in here. It's a fantastic space with great bones and more beautiful symmetry! We were missing color, texture, and some personality to match my clients' vibrant personality. Here again we took advantage of the wonderful symmetry offered by the fireplace wall and added some color and personality with vibrant furnishings and art. We kept the symmetry going with these fabulous opposing green velvet sofas and Louis armchairs. Colorful books and accessories could have made this area too busy, so we kept the rug and everything in the bookcases neutral. Their texture provides plenty of interest. Did you notice we changed out the chandelier too? The gold lantern fixture is a much better fit scale-wise and the open design keeps it from feeling too heavy. These framed Chinoiserie wallpaper panels are the star of the show, and they are completely gorgeous and timeless. We had them mounted on foam board and custom framed in very simple gold leaf frames. 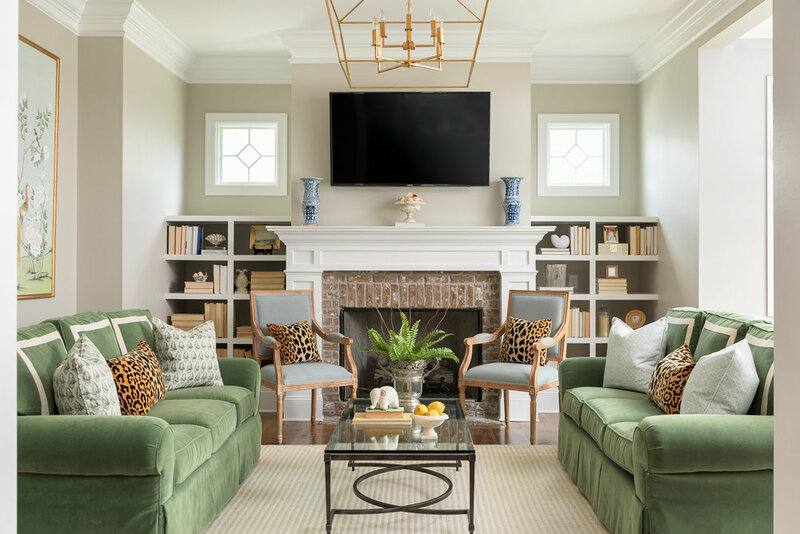 Since they are casual in style, my client's existing rattan side table and the natural fiber rug are perfect counterpoints to the dressy sofa and art. Using a mix of casual and sophisticated design elements creates elegance that is comfortable and livable! This was such a fun project and I'm a little sad to see it end, but it's fulfilling to know how much my clients are enjoying living in these new spaces and how much joy it brings them every day! If you're in the Chattanooga area and are ready to experience more joyful living at home, call Kim at 423.653.3186 and book your consultation!